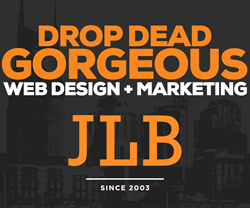 JLB, a Web Design and Internet Marketing Firm, establishes itself as one of Nashville’s fast growing small businesses in Middle Tennessee with an average growth of more than 50% annually over the last three years. Fueling new jobs and solutions in the Nashville, Brentwood and Franklin TN markets. JLB, delivers professional online Web and Digital Marketing results from concept to support. JLB was also proudly Voted the Best Web Design and Development firm by the Franklinis Williamson County Sizzle Awards which is a voters choice best-of-the-best award. JLB’s success seems to driven by its core value to incorporate all the key elements of a business’s website and Internet marketing operation. Eliminating the need for many vendors, different talents, multiple staff and technical know how. JLB can fully or partially help the business manage all the branding, design, marketing, software, hardware and different services with one contract, one bill and one business class webmaster support team focused on the businesses success. “We are really excited about the growth we have established and it’s nice to be able to provide jobs and services in the Nashville market that help everyone” said Ken Royer, JLB’s CEO. “We realized early on that businesses are truly left to figure everything out on their own and either need to have a lot of time, technical skills or money to position their business correctly in today’s Internet market. Small and mid-sized businesses just don’t have this kind of time or resources. If you really think about it, web design, development, domain names, email, SEO, SEM, Social Media, Internet Marketing, web support, hosting, security and so on are all different skills offered by different companies but they all really should work in sync to benefit the business and that is what JLB offers”. According to Royer, business owners need to be on the Internet and they need to be able to work with a company they can trust, has the resources and won’t take advantage of them. “We can provide companies with all the resources in-house with a local face-to-face relationship” says Royer. “Fortune 100 companies have large firms that take care of them and work with their staff to make sure they dominate the market, but small businesses could never afford these firms. However, JLB delivers that concept to the small business with a small business budget in mind.” A true value proposition that seems to be resonating across the Nashville, Brentwood and Franklin TN market and with many national accounts as well. JLB’s growth has been fantastic and this helps it invest back into itself. For instance, JLB invested in software that centralized all the reporting of a customer’s website rankings, social media traffic, SEO, analytics, local directories and content distribution to help with the efficiency and real time accuracy of market effectiveness of all Internet marketing strategies. JLB has also leveraged its growth to establish a business class infrastructure for its clients where they sit behind private firewalls, on dedicated servers, with website security locks, platform backups and service level expectations that cannot be established with cheap shared platforms unless you spend a lot of money. “I always wanted to build a company that could provide jobs to great people where they wouldn’t have to worry about their next check and they would enjoy their work”, states Royer. “I assume that if we do good work and take care of our communities where we operate that this would pay us back so we could pay it forward. I am so proud of our relationships with the local United Way, the TMA Group, Boys and Girls club, Sports Servants, UMC Cyber Campus, BarefootRepublic, Franklin Theatre, Franklin Special School District, Franklinis and many more.” Royer says that his business model is designed to be able to easily expand into other markets and provide the same benefits to employees and businesses market after market. JLB seems to be revolutionizing the Web Design and Internet Marketing approach for small businesses and its growth continues to bring more and more value to the marketplace with more new job opportunities and valuable services to the business community. We can expect more great announcements in the future. JLB, an award winning web marketing firm specializing in business class brand and internet solutions. Great web design, focused on brand and identity. Excellent development/integration of manageable and scalable Web and online technology. And, business class marketing and website support with on-demand marketing services.